Members of the Scripture Union enjoyed an afternoon of fun and fellowship at the annual Christmas Party in the assembly hall - see photos below. 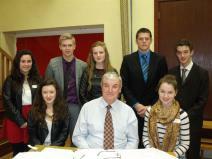 Scripture Union meets every other week (Thursday during lunch) in Room 3 and often includes visiting speakers. New members would be made most welcome. 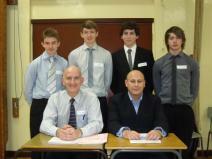 Year 12 pupils should note that the Mock Examinations commence for 12X on Thursday 16 January 2014. 12V Pupils do not start until Friday 17 January as they will be attending their vocational courses on the Thursday. The annual Carol Service in St. John's Parish Church Newtownhamilton on Tuesday 17 December proved to be a major success this year with record numbers of community members in attendance. Music was provided by pupils from Newtownhamilton High, Newtownhamilton Primary, Cortamlet Primary and Kingsmills Primary. Teacher Mr Sloan also contributed to the singing while Bible readings were delivered by pupils from all participating schools. After the service, an invite was extended to all in attendance to view the Christmas cakes in Room 5 that had been baked by Year 10 pupils from Newtownhamilton High. More images of these cakes can be found by clicking on the link below. Regular visitors to our school website will have noticed that we have recently added a new page that contains information about our Houses (Dorsey, Fane and Whitewater) and the Housepoints Reward System that is co-ordinated by Mr A Chambers. A link is provided to this new addition via our home page or view it now by clicking here. Please contact Mr N Megaw if you are struggling to source a suitable employer as he has contact details for a number of local businesses. Parents of pupils in 11V and 12V should note that there will be no vocational programme (delivered in partnership with Southern Regional College, St. Paul's High School Bessbrook and St. Joseph's High School Crossmaglen) on Thursday 19th December 2013. VEP classes will resume again on Thursday 9th January 2014. Vocational pupils not involved in the Scripture Union Christmas Party on this date are advised to use this home study time as preparation for forthcoming modules and mock examinations. 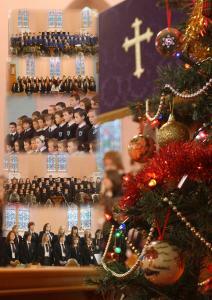 The annual Community Carol Service will take place on Tuesday 17 December 2013 at 10.30am in St. John's Parish Church, Newtownhamilton (kindly granted). Pupils from local primary schools and Newtownhamilton High will contribute during the service. Following the service, tea/coffee and mince pies will be served back in Newtownhamilton High School (Room 5) There will be also be an opportunity for parents, grandparents and community members to view the Christmas cakes that have been made by the Year 10 pupils. As part of our school's commemoration of the Decade of Anniversaries our Year 10 History pupils had the fantastic opportunity to visit Kilmainham Gaol in Dublin. It is one of the largest unoccupied gaols in Europe, and has covered some of the most significant events in Ireland's history from 1780s to the 1920s. The pupils have been studying the steps to Ireland's partition in class focusing on the Home Rule Crisis and the 1916 Easter Rising. They also visited the military cemetary at Arbour Hill and the Irish National War Memorial Gardens. 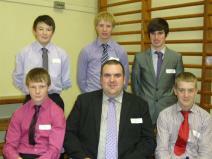 We were delighted to be accompanied by 22 Year 10 pupils from St Paul's High School, Bessbrook. Our pupils were impressed with their visit to Dublin and felt that it helped to reinforce their understanding of their study of key events in our British and Irish history. 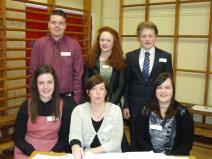 Our thanks goes to Mr Mullan and Mrs Reid who accompanied the pupils. 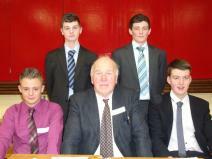 Our Year 12 pupils took part in the Sentinus Interview Skills Programme on Friday 29 November. The morning session was delivered by Sentinus Trainer Mr Pat Jamison and focused on preparing the pupils for the interviewing process. After lunch, pupils got the opportunity to put their new skills into practice by participating in an interview that was conducted by experienced interviewers from the local and wider community. 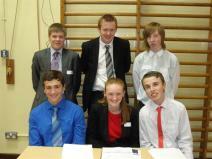 A big thank you goes to the 10 Interviewers that gave up their time to support this event. More photos can be found in the gallery section. 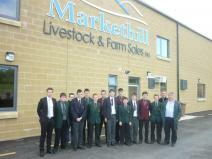 Pupils from Newtownhamilton High School, St Joseph’s High School Crossmaglen and St Paul’s High School Bessbrook pose for a photograph following a recent tour of the impressive new mart at Markethill Livestock and Farm Sales Ltd. Principal Mr G Mullan explains, “The boys are part of a collaborative initiative whereby pupils from all three schools study GCSE Agriculture & Land Use in Newtownhamilton High every Thursday. It would be uneconomic for all three schools to offer such a course to very small numbers, but by sharing education in this manner all pupils in South Armagh can avail of a wider choice of courses to suit their career aspirations. We are also grateful to St Paul’s High School Bessbrook for allowing some of our pupils to study BTEC Sports and Childcare on Thursdays”.